The studio, Reimagining Mumbais Back Bay, consciously encouraged students to suspend the reality of the complex legislative frameworks (such as the coastal zone regulation and constraints of Floor Space Index) that have, despite good intentions, resulted in paralysis in imagining new possibilities for this incredibly charged urban space. 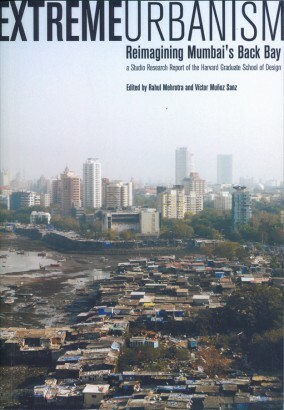 The highly contested condition of the prime location in south Mumbai, where the rich and poor collide is emblematic of the extreme conditions or urbanism that characterizes the city. Furthermore, as this is a special planning zone under the Mumbai Metropolitan Region Development Authority, it has diminished the attention that the Municipal Corporation of Mumbai has given this area in terms of planning strategies to unlock its potential. The real potential, however, is not financial gain, as much as assuring equitable access to housing and creating the public spaces that the city desperately needs. The studio process was founded on the belief it was possible, through strategic design thinking, to demonstrate how several constituent components of the site in the Back Bay could be accommodated in the same space without necessarily affecting the city and its infrastructure. In fact, the studio aspired to achieve strategies to unlock the potential of this space for public good. This spatial resolution of otherwise seemingly intractable problems, while designing for the existence of disparate worlds in the same space of the city, was the central challenge for the studio. The projects that emerged set out not so much to critique the existing legislative constraints but rather to demonstrate how the special planning zone designation can be leveraged in potentially useful and exciting ways for the city to resolve the sharp contestations in Mumbais Back Bay.